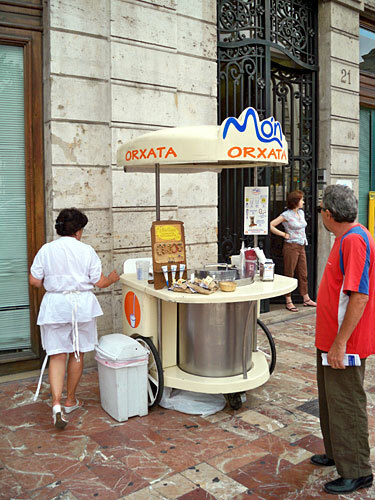 If you’ve spent much time walking around Valencia, you’ll be familiar with the carts of Món Orxata, hawking delicious horchata to hot, thirsty pedestrians. They’re a mainstay of the Plaza de Ayuntamiento and can also be found at the Ciudad de Artes y Ciencias, as well as a few other places. Recently, the company launched the world’s first online Horchata Delivery service, available from their website. Freshly made all-natural Orxata is now available throughout Spain. Most of the orders are gifts for Valencians who currently live elsewhere and don’t have much opportunity to enjoy the famous drink — at least not one fresh from Alboraya (the birthplace of horchata). They told us that a recent order to Zaragoza had a gift note reading, “Happy Birthday Grandpa, your grandchildren from Valencia love you”. If you’ve never sampled Horchata (or, “Orxata”, in the slightly-cooler Valencian spelling), you owe it to yourself to stop by one of the Món Orxata stands. High-quality stuff and especially delicious in the summer heat. Until a couple years ago, Mon Orxata had been at the Mercado Colón, but that location is now under different ownership and currently known as La Casa de l’Orxata. It’s a great spot to enjoy the quintessential Valencian drink! We got nothing for this post. But we got invited to go to their factory to take some picutres. So that’s pretty exciting.